Donna Perlmutter on LA Observed has been closely watching Mirga Grazynte-Tyla at the Philharmonic. I’m describing what happened when maestra Mirga (let’s simply dispose of her last name for now) did Mahler Four with the Philharmonic. She let out all the stops, gave Mahler his head in each touchstone of the above and let the score dictate those emotionally graphic environments in full-out dimension. So get this: In front of a huge orchestra playing Mahler, gargantuan music that often looms over the world, she remains a slight figure, as they say, a mere slip of a girl. When it storms she jumps up and down — like a feather, not with power. She leads with her undulating arms, mostly bare arms (while all orchestra members and all conductors, even other women baton-wielders, are sleeved). And because Mirga uses no shoulder engagement, the kind needed to lean in and down to embrace low strings and draw a sense of sweeping depth, the sound doesn’t match the picture that players usually rely on. Instead, she resorts to fiercely gesticulating fingers, powerful facial animation and, in rhythmically geometric music, angular arm movements. One observer wrote: “Mirga needs to find her inner man” — for which he was roundly criticized. But then the creative connoisseur Gidon Kremer, who knows best, has given Mirga a big nod — so that pretty much takes care of that issue. He joined her and the orchestra for the Weinberg Violin Concerto and together they summoned up this grave, dense work so darkly gripping in the eastern European spirit of Shostakovich — as Kremer’s playing conjured distant, far-away cries in the night, aptly enervated. So conductors are now judged on their arm-waving technique? I innocently thought a conductor’s worth was in their preparation of the piece. I agree. I thought conductors should be judged by the difference they make on the orchestra’s music making. And the difference she makes to the sound is striking, as you’ll hear for yourself if you attend her concerts. My comment was about the review. I haven’t heard Mirga live and won’t have a chance to in the foreseeable future. No. Preparation is important [sometimes….]. But something has to be left for the night. A public performance depends on a moment by moment control of the dynamics, phrasing, articulation, pacing, and goodness knows what else that makes a performance. You could actually watch this happening with the likes of Klemperer, Kempe, Giuliini, Barbirolli, usw. Carlos Kleiber is said to have offered to conduct either with more rehearsals than normal, or with none, relying on the inspiration of the moment the rapport between conductor and orchestra. Your description sounds like Gergiev years ago. he used to jump up and down and wiggle his fingers etc. If this is what Donna Perlmutter thinks of Mahler 4, she should be banned from Mahler attending any other Mahler Symphony! Exactly. No need to read past that point. I am trying to imagine what a gendered musical gesture would be. Is conducting a male profession? Until today I think so. Worked with Alsop, Faletta, Carneiro ,Mälkki and Xian Zhang. From this group only Zhang stands out. 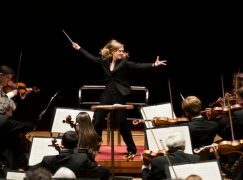 Most female conductors have very strange body movements and their way of conducting looked weird and not proffessional. What I saw from this lady was exactly the same as with the ones mentioned above. Hopefully in the future there will be so a female conductor with real charisma and talent…. Good point, Ben. You speak out of my soul. And don’t forget our beloved Alondra. Just know Alsop from your group but like to add Simone Young, the young and very gifted and well trainerd Joanna Mallwitz and especially the newly appointed music director in Graz, Oksana Lyniv. All of them have a stunning career mostly in the opera business in german speaking countries with the broad repertoire system. I knew them all from the opera and what I can say as a professional orchestra musician for more than 30 years: All the mentioned ladies know and do their job in conducting very well and that‘s the point. Nothing else. Ms. Perlmuter is articulating double standards without probably knowing what‘s going in the conductiong busines. On stage you add the show. In the pit, it‘s the true story of communicating between conductor and musicians. I think of Emmanuelle Haim as the real deal in Baroque music. More often than not, I am blown away by the performances she draws from Le Concert d’ Astrée – though I judge from recordings. I don’t care about her gender, know nothing about her sexual orientation and have not been visually impressed by her conducting. I just listen and enjoy. This does read very strangely. It’s as if the writer is bemused and surprised by the notion of a women conductor. Such as ‘mere slip of a girl’, mention of her bare arms (how relevant is that?! ), etc. Her syntax is all over the place. There are legitimate reasons to praise certain aspects of Mirga’s conducting as well as to criticize it constructively, but neither can be found in this silly “review”. Wish I had been in LA… Must have been a sublime concert. I think the writer imagines the conductor’s job is about mimed gestures and not about running productive rehearsals. With a name like Donna Perlmutter she must be a cross between Opera Chic and parterre box. Are we to take this as a serious piece? I think we all get by now that NL is carrying not just a torch, more a bonfire, for Ms we’ll simply dispose of her last name for now, but it is difficult to understand how quoting dross like this review helps in his crusade to claim her as the greatest living conductor, fluid gender(!) or not. A dark and stormy night, no doubt. This review is nothing but a treacly pile of rubbish having nothing to do with actual music. I have no doubt if a male wrote this rubbish, he would be soundly criticised for insensitivity and anti-feminism. “mere slip of a girl…” Why even reprint such a piece? Never heard of LA Observed. Never heard of Donna Perlmutter. That said, her piece inspired me to start a campaign to include “Conducting” in the next Olympics. It will be scored on Technical Difficulty and Artistic Impression, on a scale of 10, on moves such as the “Triple Bernstein” or the “Double Abbado Loop”. Then there should be “Synchronized Conducting” but only for women, no men, no mixed couples. “Equestrian Conducting” is done on horseback. “Conducting Diving” from 3m and 10m platforms will be the ultimate conducting competition. The main problem with articles as poorly-expressed as this is that they open a door to the usual unmusical crowd of misogynist trolls (see above). I’m increasingly less interested in hearing opinions on Mirga from anyone who hasn’t heard her conduct live- or been conducted by her. Many of the remarks here speak of a wilful ignorance, rooted in some extremely ugly prejudices. What has, for instance, Ivan Fischer to say about conductrices? I think it’s great that also women get a chance to demonstrate their musical prowess. Although I have to admit that the only time ever I had a clash with a specimen of the conducting breed, I was subjected to paranoia, arrogance and aggression which came from an female, completely wrapped-up in irrational projection. Shouldn’t women be banned from interpreting men’s music, and men banned from interpreting women’s music? What an absolute load of horseswallop. Literally every sentence is objectionable. The role of the conductor is massively overrated. Set the tempi, make sure the orchestra starts and finishes together, make sure the balance is right and what needs to be heard, is heard. The best orchestras play their best with minimum intervention from the person up front. Or at least did. But audiences need a focus, and classical audiences are conditioned to believe in learned authority, the myth of the divinely inspired and inspiring. That role in this art-form by rights should belong to the composers of new music whose great works encourage new audiences to flock to the concert hall , and inspire those already coming to return again and again. Oh hang on, conductors it is then. Jusat to get all the notes right so that they be heard, is only the groundwork. On that foundation, the music has to come to life, and that is dependent upon the conductor. Most postwar new music does not have that 2nd stage so reheasing is finished when the notes are (more or less) in place. With the old war horses, the music is known to everybody so the 2nd stage has already a bedding. When an unknown work fro, say, the 18th or 19th century is dug-out, that 2nd stage can be quite hard work. Feathers cannot lead a dynamo, and do the players follow her baton or her hair? What is the audience supposed to focus on, the music, or her hair flouncing about? She is unprofessional. I watched some women conduct as students, and their flimsy beat pattern was completely ineffective, they had no leadership qualities or energy. They are now very active in secondary positions. Now a woman like Jorja Fleezanis could lead well, she is tall and strong and forceful. Music is not made up of feminine energy, it is, if not androgynous, masculine, and that is its beauty.